What is a collecting machine? The collecting machine is an indispensable tool for environmentally conscious, forward looking and proactive production facilities where large amounts of PPE, tools and MRO are used during the manufacturing process. It collects used equipment, and registers the person and the type of material that was collected. This makes it easy to monitor unjustified use of equipment. 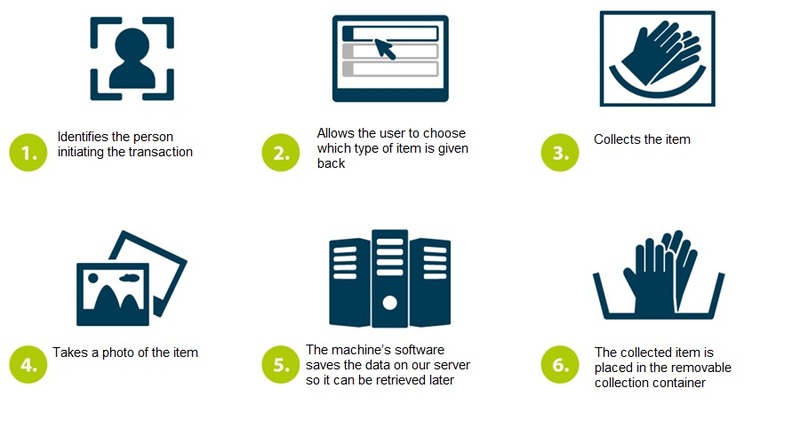 The back-office software allows you to take control: you can decide which items can be picked up only if the previously used one really needs to be replaced. and you can follow-up the recycling of used and collected items. GET A FREE CONSULTATION ON COLLECTING MACHINES NOW! Controlled collection of equipment and environmental follow-up to keep you focused on production! supervise bins for non-recyclable waste?
" In our pharmaceutical company disposable gloves and hair nets are disposed of by the hundreds every day, because employees have to use new gloves after each break, which means at least 4 pairs/employee for every shift. These items are not allowed to be disposed of as municipal waste, they are disposed of separately. The collecting machine helps us control the number of PPE picked up and given back by each user. This way the employees will not continue work in used gloves and will not throw other types of trash (e.g. tissues) into the bin used for collecting gloves." "We use thick heat resistant gloves in our plant for moving hot iron. These gloves last a long time but get dirty easily. We wash these gloves ourselves. Our employees leave gloves lying around just like teenagers leave their stinky socks all over the place. By using the collection machine the gloves all go in one place and we can follow the number of gloves picked up and when they are dropped off into the machine. We wash the gloves and our employees can pick up clean gloves from the PPE vending machine." "50 people use flex cutting discs in shifts at our metalworking company. It is almost impossible to keep track of the types each employee uses and how long it takes for them to wear. The collecting machine makes it possible for us to dispense new discs only when it is reasonable - when employees have given back the ones that can't be used anymore. We were able to cut monthly disc purchases by 20%." "We manufacture machinery and every month we use lubricants in high amounts for oiling. During the manufacturing process it is easier to use smaller cans of oil sprays and it is not unusual for us to use up oil spray cans by the dozens every day. To be more environmentally friendly and increase cost-efficiency, our supplier refills the cans under specific conditions. Collecting the cans and shipping them to the supplier used to be a big problem. The collecting machine can hold a week's worth of cans and makes it easier for us to schedule reordering. Now we can plan and calculate lubricant purchases more precisely." SHALL WE FIND A SOLUTION FOR YOUR PROBLEM?